The We Are All One Concert was held in the city of Inglewood California on Sunday, October 13th 2013 at the Hollywood Park Casino. A place where winning is the goal and chances are taken. As many people were gambling, down the hall and up the escalator is where this reggae concert was held. Junior Francis one of the best Jamaican Reggae MCs here in California hosted this event. Junior is well known for his speedy introductions yet informative and enlightening knowledge he represents toward each artist welcomed on stage. The lineup of performers included two LA based Polynesian rooted bands: The Hooliganz and Laupepa Letuli. Eljai a Belizean sensation and Big Mountain a Californian band that got there fame in the 90’s were also set to perform before the two headliners Maxi Priest and Ky-Mani Marley. This highly promoted event by Joyce Productions was set to start and with the first performing act The Hooliganz. They performed nicely, bringing their local fans up closer and new fans amused. Two popular songs included: Wild Fire and “Vibe so Nice. The other Polynesian group was Laupepe Letuli. This group had never performed at a concert till now. You could tell their excitement through their high energy performance. Their interaction with each other was amazing. Think Twice Lucky and Pepa were some of the favorites that they proudly performed. 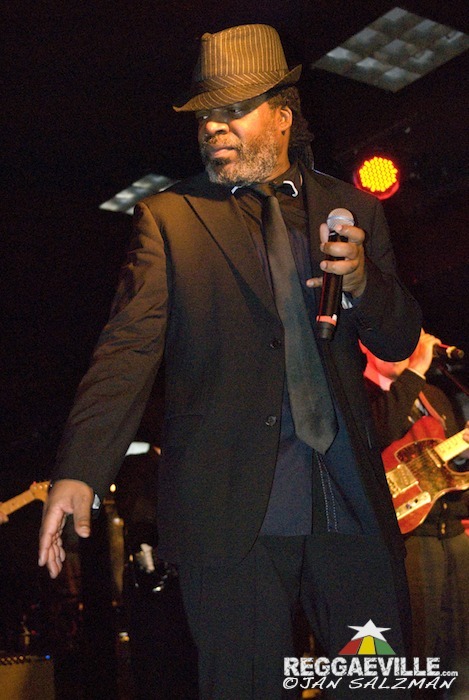 Eljai was backed by Detour Posse, an internationally known backup band, based here in Southern California. With many sound issues the other groups were having this band knew what to do to keep the sound as clear as possible. Once Eljai walked on stage the crowd got closer and bigger within each song performed. Songs favored were 24/7, Machine Gun, and Blessed. This passionate artist did not disappoint the crowed as he poetically rocked the microphone singing for many of the women in front of the stage. Thanks to Detour Posse's professionalism and experienced work, Eljai sounded amazing. Lloyd Brown, a popular UK reggae artist, was up on stage with a new LA band called Lightning Flash backing him for the night. This band has a nice ska sound and Lloyd Brown is an exceptional talent that laid great vocals to some well favored songs. Songs that romantically had couples dancing were “It’s A Love Thing”, “Show Me That You Love Me and Main Squeeze throughout the night. Each performing act had some difficulties with the quality of sound provided, but they still maintained a positive attitude and performed for their fans and loved ones. Big Mountain on stage were thrilled to be performing since their last performance in Los Angeles was 10 years ago. When the band was setting up more sound issues occurred which made it hard for them to even start their performance. The crowd waited a good thirty more minutes. Even as the sound was not up to par with Big Mountain they started their performance anyways. The first song they performed was Reggae Got Soul A lot of fans were enjoying their music as the sound kept cutting out they did their best to keep the music going. Staying positive was all they could do as they moved forward and completed the set with their most popular songs Baby I Love Your Way and Revolution as encore. Sound clarity is very important and with many problems occurring throughout each performed set the headliners were not going to perform till this issue was taken care of. Unfortunately Maxi Priest and Ky-Mani Marley made the decision not to show and had the fans that came to see just them very disappointed. The night ended with confusion. Reggae concerts are meant to bring positive vibes but this all age event ended poorly. A man walked on stage and spoke through the microphone with concern and irritation stating to please take your children home as things may get a bit rowdy due to the headliners NO SHOW outcome. Giving thanks to all the performers that did their best. But it still brought such sorrow for the Los Angeles reggae community due to the lack of professionalism the sound engineers performed and the promoters’ way of resolving the situation in such a poorly and unfair manner. Reaching out to all my family, friends, and fans who came near and far to see me perform last night in Inglewood, California. Regretably, I am having to write to you for the confusion surrounding my non performance at the concert held at the Hollywood Park Casino. My band and I was there and ready to peform for you but, unfortuanltly we were unable to perform due to the sound company not being retained by the Promoter in a manner where the show could continue. With no sound our set could not take place. It is our hope that the Promoter will be able to rectify this situation and amend the inconvenience to everyone. We were there willing and ready !! !